When I was a kid, Gyo Fujikawa’s book Oh! What a Busy Day was my jam. I can remember studying each illustration over and over to spot all of the little surprises – a tiny snail tucked in a cabbage leaf curl, a gray squirrel hidden under the bench. I especially loved this page. The shabby tree shanty stuck in my mind as a model hideaway. That’s a good thing because it’s prepared me to find charm in the Sea Shanti’s garden shed aesthetic. We’ve got to renovate the entire inside, so it’s composed almost entirely of loose plywood, minor leaks, and good intentions right now. 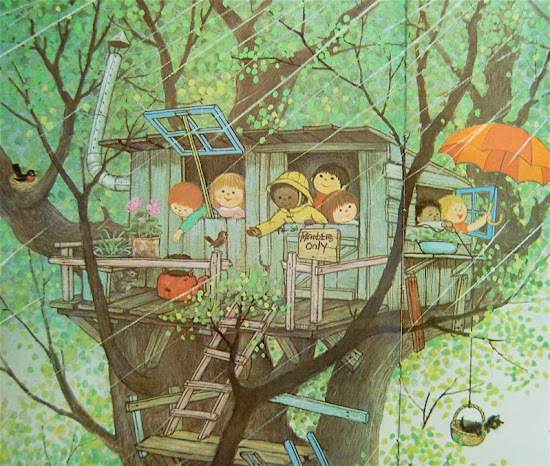 When I woke up to the sound of torrential storms this morning, I imagined that I’d finally achieved my childhood dream of living in Fujikawa’s treehouse. Squeaky helps complete the fantasy. A lot about this endeavor reminds me of Oh! What a Busy Day, come to think of it. My skinned knees and the sudden urge to jump over puddles instead of just skirting them, for example. Watching the little green lizards leap from one branch of the azalea to another in front of the marina’s restrooms. Sleeping in a hammock with the wind blowing through the companionway. Currently, however, I’m pretending that we’re among a hardy group of survivors living in the wake of an apocalypse of some sort. Preferably zombies, but more realistically deluge-oriented given the flooding in New Orleans. Under those circumstances, our digs are luxurious. All that being said, this was our first weekend on the boat, and it’s not been objectively awesome. Rain’s dumped on us for a couple of days, revealing every single crack and crevice of the boat. We’ve moved from a deflated air mattress to a couple of low-slung hammocks that roll us into lumpy balls of aches and grunts. We’re making do with a fan, no AC. Taco Bell and Waffle House have become our second homes. In other words, harbor no delusions about what we’re doing. It’s definitely not yacht rock life. Have you ever seen Cabin Boy? It’s closer to that. However, Past Jack and Autumn totally knew what they were doing when they set this ridiculously ambitious drop dead date. They knew it was going to be tight. They knew it was going to be uncomfortable. They knew it was going to be inconvenient. But they knew we’d have to get it done and get it done fast if we were going to do it at all. So here we are. Up a boat without a paddle or an engine or a steering wheel. It’s going to be totally worth it when we get through the rough patches, and we’re getting a hero’s share of those. To date, we’ve had a busted phone, a broken car window, a few unanticipated leaks in the Sea Shanti, a storm of the decade, and the aforementioned air mattress catastrophe. All have been casualties to our determination to get this boat up and at ’em. Until then, think buoyant thoughts. Keep the faith honey – I know you have the right attitude. I think given the unfortunate state of New Orlean’s weather recently you might be in the better place! Given the state of New Orleans, a boat in a boatyard might be exactly the right decision! XD Gimme a week to get caught up on life and get my bearing, and I’m going to give you a call! Thanks for the encouragement! Squeaky is loving the boat. So far. We’ll see how he does once it’s bobbing on the water.